Purpose: To develop and validate a deep learning algorithm that predicts the final diagnosis of Alzheimer disease (AD), mild cognitive impairment, or neither at fluorine 18 (18F) fluorodeoxyglucose (FDG) PET of the brain and compare its performance to that of radiologic readers. Materials and Methods: Prospective 18F-FDG PET brain images from the Alzheimer’s Disease Neuroimaging Initiative (ADNI) (2109 imaging studies from 2005 to 2017, 1002 patients) and retrospective independent test set (40 imaging studies from 2006 to 2016, 40 patients) were collected. Final clinical diagnosis at follow-up was recorded. Convolutional neural network of InceptionV3 architecture was trained on 90% of ADNI data set and tested on the remaining 10%, as well as the independent test set, with performance compared to radiologic readers. Model was analyzed with sensitivity, specificity, receiver operating characteristic (ROC), saliency map, and t-distributed stochastic neighbor embedding. Results: The algorithm achieved area under the ROC curve of 0.98 (95% confidence interval: 0.94, 1.00) when evaluated on predicting the final clinical diagnosis of AD in the independent test set (82% specificity at 100% sensitivity), an average of 75.8 months prior to the final diagnosis, which in ROC space outperformed reader performance (57% [four of seven] sensitivity, 91% [30 of 33] specificity; P , .05). Saliency map demonstrated attention to known areas of interest but with focus on the entire brain. Conclusion: By using fluorine 18 fluorodeoxyglucose PET of the brain, a deep learning algorithm developed for early prediction of Alzheimer disease achieved 82% specificity at 100% sensitivity, an average of 75.8 months prior to the final diagnosis. In this study, we aimed to evaluate whether a deep learning algorithm could be trained to predict the final clinical diagnoses in patients who underwent 18F-FDG PET of the brain and, once trained, how the deep learning algorithm compares with the cur- rent standard clinical reading methods in differentiation of patients with final diagnoses of AD, MCI, or no evidence of dementia. We hypothesized that the deep learning algorithm could detect features or patterns that are not evident on standard clinical review of images and thereby improve the final diagnostic classification of individuals. Our study had several limitations. First, our independent test data were relatively small (n = 40) and were not collected as part of a clinical trial. Most notably, this was a highly selected cohort in that all patients must have been referred to the memory clinic and neurologist must have decided that a PET study of the brain would be useful in clinical management. This effectively excluded most non-AD neurodegenerative cases and other neurologic disorders such as stroke that could affect memory function. Arguably, such cohort of patients would be the most relevant group to test the deep learning algorithm, but the algorithm’s performance on a more general patient population remains untested and un- proven, hence the pilot nature of this study. Second, the deep learning algorithm’s robustness is inherently limited by the clinical distribution of the training set from ADNI. The algorithm achieved strong performance on a small independent test set, where the population substantially differed from the ADNI test set; however, its performance and robustness cannot yet be guaranteed on prospective, unselected, and real-life scenario patient cohorts. Further validation with larger and prospective external test set must be performed before actual clinical use. Further- more, this training set from ADNI did not include non-AD neurodegenerative cases, limiting the utility of the algorithm in such patient population. Third, the deep learning algorithm did not yield a human interpretable imaging biomarker despite visualization with saliency map, which highlights the inherent black-box limitation of deep learning algorithms. The algorithm instead made predictions based on holistic features of the imaging study, distinct from the human expert approaches. Fourth, MCI and non-AD/MCI were inherently unstable diagnoses in that their accuracy is dependent on the length of follow-up. For example, some of the MCI patients, if followed up for long enough time, may have eventually progressed to AD. Overall, our study demonstrates that a deep learning algorithm can predict the final diagnosis of AD from 18F- FDG PET imaging studies of the brain with high accuracy and robustness across external test data. Furthermore, this study proposes a working deep learning approaches and a set of convolutional neural network hyperparameters, validated on a public dataset, that can be the groundwork for further model improvement. With further large-scale external validation on multi-institutional data and model calibration, the algorithm may be integrated into clinical workflow and serve as an important decision support tool to aid radiology readers and clinicians with early prediction of AD from 18F- FDG PET imaging studies. We here demonstrate that DNA methylation-based CNS tumour classification using a comprehensive machine-learning approach is a valuable asset for clinical decision-making. In particular, the high level of standardization has great promise to reduce the substantial inter-observer variability observed in current CNS tumour diagnostics. 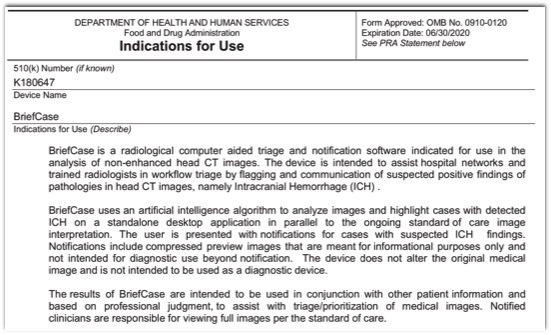 BriefCase is a radiological computer aided triage and notification software indicated for use in the analysis of non-enhanced head CT images. The device is intended to assist hospital networks and trained radiologists in workflow triage by flagging and communication of suspected positive findings of pathologies in head CT images, namely Intracranial Hemorrhage (ICH) . BriefCase uses an artificial intelligence algorithm to analyze images and highlight cases with detected ICH on a standalone desktop application in parallel to the ongoing standard of care image interpretation. The user is presented with notifications for cases with suspected ICH findings. Notifications include compressed preview images that are meant for informational purposes only and not intended for diagnostic use beyond notification. The device does not alter the original medical image and is not intended to be used as a diagnostic device. The results of BriefCase are intended to be used in conjunction with other patient information and based on professional judgment to assist with triage/prioritization of medical images. Notified clinicians are responsible for viewing full images per the standard of care.